Potato Poha Cutlet is a delicious Indian recipe served as a Snack. It is made of Poha / Flattened Rice (which is also known as Pohe or Atukulu) with boiled potatoes and spices. 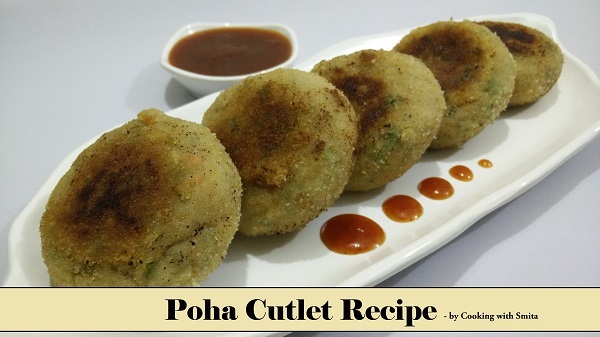 Learn how to make Poha Cutlet, a healthy snack or breakfast with this easy step-by-step recipe. After 10 minutes, add Poha in a large bowl. Add all ingredients in the same bowl except oil. Mix well all ingredients and make dough for Cutlets. If dough is moist, add breadcrumbs and make sure it can hold the shape of the cutlet. Prepare your desired size cutlets. Make Maida (All Purpose flour) paste by adding water, make sure there are no lumps. Dip cutlets in Maida Paste and coat with breadcrumbs one by one. Add some Oil in the frying pan and shallow fry cutlets over medium flame till they turn golden brown on both sides. Serve hot Poha Cutlet with chutney or Sauce.